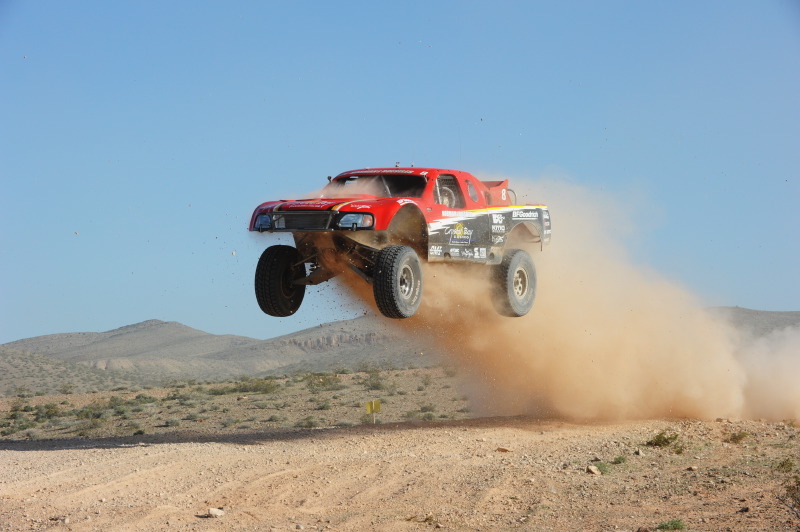 RENO, NV MARCH 22, 2011 – Roger Norman is gunning to repeat the success from last years Mint 400. The Norman Motorsports #8 Crystal Bay Casino truck qualified and finished first last year putting Roger Norman on the podium with an amazing finish. “Winning overall coupled with taking the pole position in qualifying makes this an epic event for us,” said Norman after last years finish. Roger Norman spent Saturday assisting other racers and the SNORE team mark course for the race. “We placed down arrows, turn arrows, all of them, ensuring that it is ready for this weekends race,” said Norman. “The track seems a little rougher but we are still going to use the same strategy that we did last year: No mistakes or issues, and we will be keeping a close eye on where we are in the race.” Eric Branstrom, who co-drove with Norman for last years win, will co-drive again this year. The #8 Trophy Truck has been at Norman Motorsports shop in El Cajon, CA getting a new mounting system for the shock reservoirs. “We have also been working on upgrading the drivetrain. We just continue to add quality reinforcements after reinforcement to all the components in the truck as the courses get rougher and rougher,” said Norman.